There is no way I can do the past stranding season justice in words, but I'll try. I'm blessed with having a job where I make my own hours. From December 1 to February 1 I feel like I spent so many evenings working into the wee hours of the morning playing catch up so I could spend most of my days at rescue and rehab—and I couldn't have been happier! Every morning that I was able to come in the energy was almost palpable, new faces from all departments, outside organizations, all with this amazing energy. And the staff, as exhausted as they must have been, always starting the day off with big smiles and "Ok, let's do this!" handling every challenge with grace and even a sense of humor, above all making sure that the volunteers were well cared for as well as the turtles. 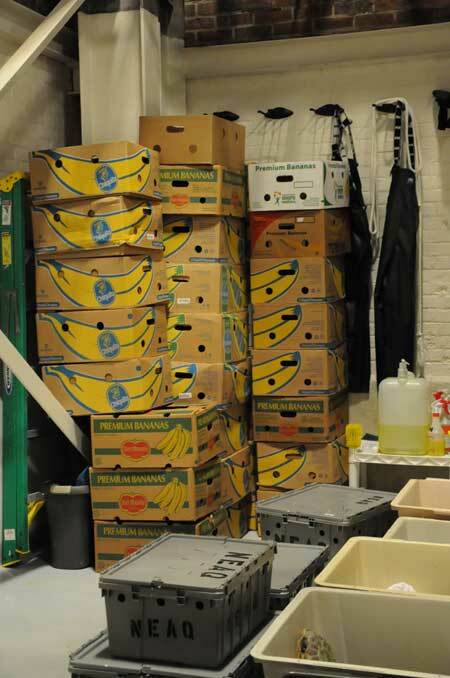 All these empty banana boxes arrived full of turtles! There were dozens of banana boxes filled with new turtle patients every morning and evening, and the patients got larger and larger as December came to a close. There were so many huge loggerhead turtles that came through the doors that there was absolutely no room for! But the staff kept finding room, finding other facilities to help us out, rearranging pools, and ultimately creating "Loggerland" where we put the dozens of giant turtles in the 24 foot pool together and staff and volunteers would don drysuits and walk around in the pool trying to coax these gentle giants to eat. I think my favorite case was #206 though. When you work with the turtles there is always that one case that you feel like you really had an impact on, or had an impact on you as it more often seems. #206 was it for me. She came in as one of the last Kemp's late in the season, lethargic, cold, on a day that I had swim room duty. When the turtles come in we take initial vitals—heart rate, respiration rate, temperature, and blood samples—and then they immediately go to the swim room to get them moving, so they can "remember that they are turtles" as the staff says. I remember supporting #206 in the 55 degree water with my hand until it went numb, moving her flippers, getting her stimulated, and then she started swimming very very slowly. I watched her for her ten-minute initial swim and then took her out for a rest. While waiting for her second swim, I noticed she had not taken a breath in her box in a while and alerted Adam. We moved her into the clinic and tried to encourage her to breathe but something wasn't right. Adam administered some medications to stimulate breathing and I took her back out to the pool to get her moving again. She was so limp and not very responsive, her flippers just dangling below her in the water, my palm under her carapace supporting her, her head resting on my wrist. It seemed like ages before she took a breath and started to move on her own again, and even then it seemed something was a little off. I'd reach in the cold pool as she swam around slowly and would have to lift her head for her and it was like she suddenly remembered and she'd take a breath. I must have spent hours watching that turtle over the next few days, making her my own personal ward, really wanting this one to pull through. It was touch and go with that turtle for a long time, there was nothing that the staff could find wrong with her despite various diagnostics, but she wouldn't eat for the longest time which is often how some underlying illnesses manifest. We had to tube feed her for weeks, which requires extra handling and can irritate the throat so it isn't ideal, and as we watched some of our other patients go downhill I kept thinking "No, not that one. She's going to make it." 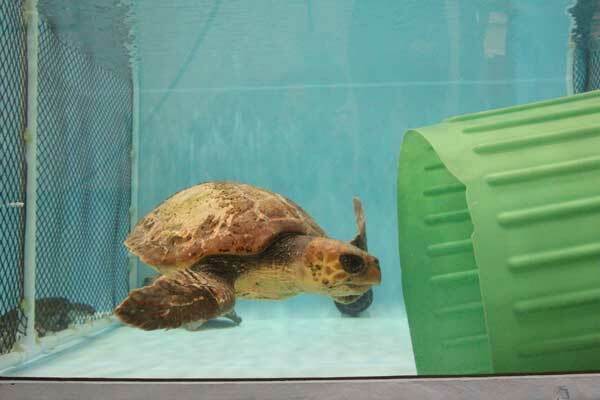 It's so hard not to get attached to those little shelled patients, even though we know that we can't save all of them. But #206, now she's one of the healthiest turtles in the facility, she just can't get enough squid heads, and I'm so glad I was able to be a part of her recovery. 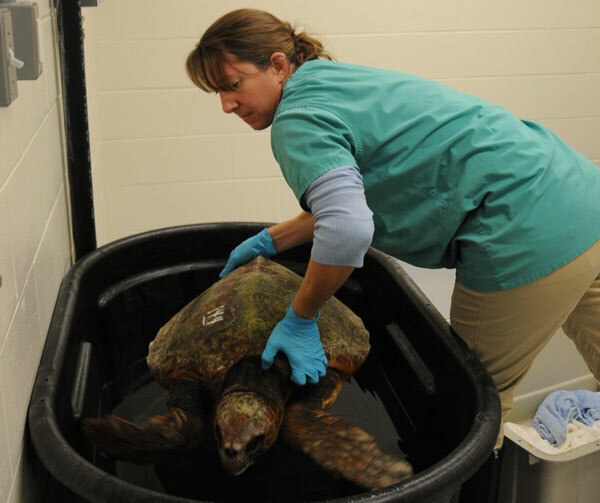 Learn more on the Marine Animal Rescue Team Blog! 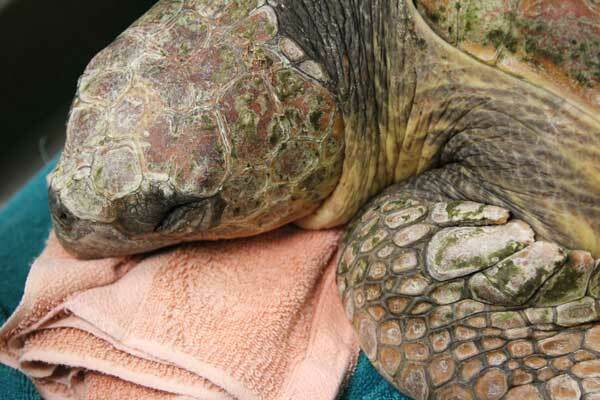 See pictures and read about last year's the record sea turtle stranding season. Here's the perspective of another volunteer on the ground during the thick of the stranding season. 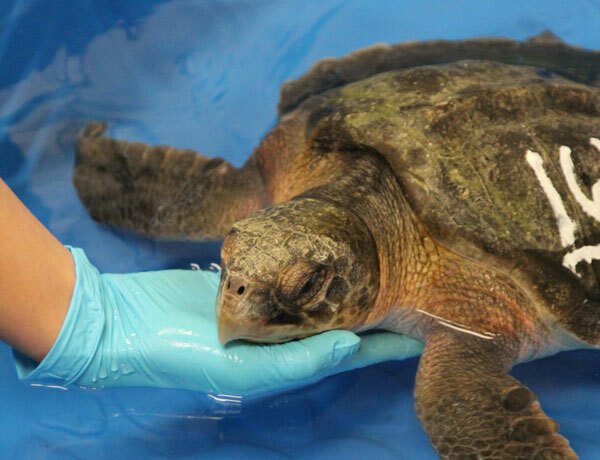 Volunteers helped released a pair of now-healthy turtles from Martha's Vineyard last week. Volunteers were also on hand for a road trip release special down to Long Island.